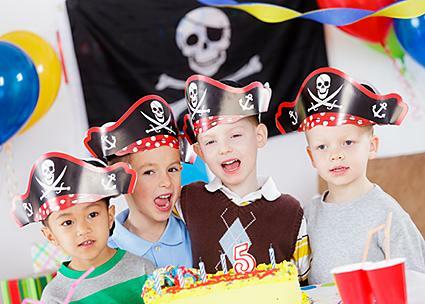 Whether you need a birthday party activity or just want a project to fill up a rainy afternoon, you'll love these pirate crafts for kids to make. Pirates have always figured heavily in children's books and movies, but these days they are more popular than ever. If your children are captivated by the mysterious and rebellious nature of pirates and the romance of the high seas, these crafts will be sure to capture their imaginations. Nothing says "pirate" quite like an eye patch. 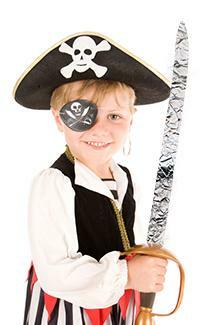 Making this craft will give kids an essential part of a pirate costume. You can make this eye patch from items you probably already have around the house, which makes this project a perfect choice for spontaneous crafting sessions. Cut the toilet paper tube lengthwise, and spread it open. Cut out a large oval for the eye patch. 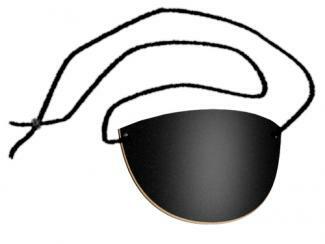 Holding the cardboard eye patch against the construction paper, use a pencil to trace it twice. Cut both shapes out of the paper. Use the glue to affix the black paper to the cardboard patch. Allow one side to dry before doing the other side. Make a hole on each side of the eye patch using the hole punch. Tie the black yarn through the hole, and then use it to attach the eye patch to the child's head. 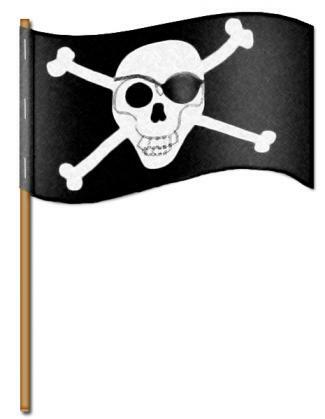 Your little pirates will enjoy making a Jolly Roger to fly on their bedroom walls or decorate their bikes. All materials for this craft are available at your local craft store; many items can be purchased for under a dollar. Arrange the piece of fabric so that one of the long sides is facing toward you. Use the fabric paint to make a free-hand design of a skull and crossbones on the fabric. Younger children might enjoy using a stencil for this part of the project. When the paint is dry, place the dowel along one of the short sides of the fabric and wrap the fabric around the dowel. Use the stapler to secure the flag to the pole. 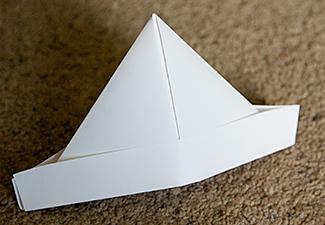 Origami is a great way to teach kids about math, and it's also a fun method for creating a pirate hat. This project is best for older kids, since many young children find it difficult to get precise folds. Arrange the paper so the short side is facing toward you. Fold the top of the paper down to meet the bottom. Find the center of the top fold, and fold each of the top corners down from this point. Your shape will now resemble a triangle with two flaps at the bottom. Fold each flap out toward the outside to make the hat's brim. Your hat is ready to wear! Every pirate needs a ship for sailing the high seas. 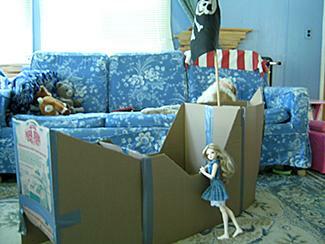 An old refrigerator box creates the perfect base for hours of sailing fun. Lay the box on the ground so its long side is down. Cut off the opposite side to create the ship's opening. Cut the two sides of the box to resemble a ship, with a dip in the middle so the ship is higher at the front and back. Set the kids loose on the ship with tempera paint. They can enjoy hours of dramatic play using the pirate costumes and the ship. Pirates and treasure maps go hand in hand. 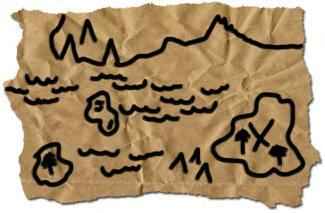 Little pirates can make a custom treasure map that looks authentic in this fun craft. Help the kids tear a square from a large brown paper bag. Leave the edges rough for an old look. Crumple the paper and smooth it out a few times to add to the old appearance. Sprinkle water on the paper and then let it dry. Smear brown ink on the paper to give it an even more aged look. Encourage the kids to draw cliffs, oceans, islands, mountains and other land features along with the "X" to mark the location of the treasure. For more fun, draw your own treasure map that represents the house and yard. Hide a treasure at the spot indicated on the map. Let the kids use the map to discover the treasure. The hook hand serves as both a craft and part of a pirate costume. Aluminum foil creates a child-safe hook. Crumple a strip of foil to create a long snake shape. Curve the end into a hook shape. Use a large, sturdy paper cup for the base of the hook. Apply a coat of paint or a piece of construction paper to personalize the cup. Use the scissors to poke a hole in the bottom of the cup. Slide the end of the aluminum foil hook into it. A piece of tape on the inside of the cup secures the hook in place. No pirate is quite complete without a sword, and these super-safe swords are perfect for kids to make. They're also lots of fun! Draw the shape of a pirate sword, including the handle, on the piece of cardboard. Cut out the shape. Adults may have to help with this part of the project. Paint the sword handle in the desired color, and allow it to dry. Cover the rest of the sword in aluminum foil. 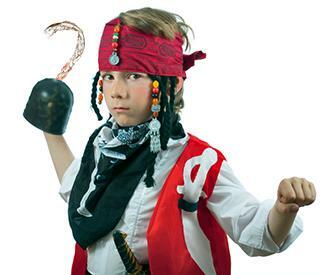 If you need to keep your kids occupied for an afternoon, try these pirate crafts for them to make. After they finish the projects, they'll be entertained for hours pretending to sail the high seas in search of treasure.